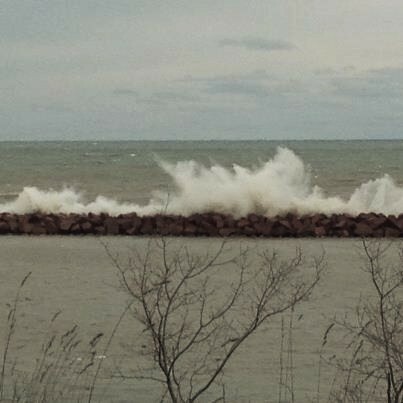 A wee bit of Hurricane Sandy has made it’s way as far west as Milwaukee which has Lake Michigan a tad pissed off. After an early morning training session, I grabbed a breakfast burrito and headed down to the lake to listen to the roar of the waves and enjoy the view. While it was a bit windy, it was fun. Now I’m home, drinking coffee and catching up on some reading. Here’s a great article by Jim Wendler on trying new things in the gym. My favorite line? Remember, remaining stagnant and stubborn is easy, but it takes a better man to expand their horizons (and lifts) with methods that may be contrary to their beliefs. This entry was posted in Uncategorized and tagged barbells, Jim Wendler, Lake michigan, strength training, t-nation. Bookmark the permalink.